Jacques Tati introduced the world to his spindle-legged alter ego, Mr. Hulot, with 1953’s peerless Mr. Hulot’s Holiday, a spoof of middle-class leisure that remains one of the 20th century’s grandest comedies. 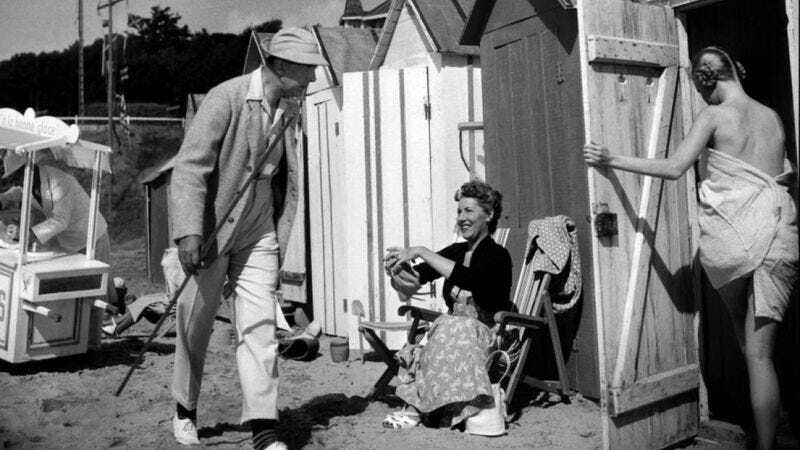 Debuting the humorous template that he’d develop further in his iconic protagonist’s later outings Mon Oncle, Playtime, and Traffic, the writer-director-star charts the meandering vacation of Mr. Hulot at a French seaside hotel resort. There, the klutz comes into contact with a variety of types (French, British, and American) who stumble and bumble about with almost as much cluelessness as he does. A tall, pipe-smoking gent in a cap whose brim is upturned at the back, Tati’s Hulot is a genial doofus incapable of avoiding pitfalls both large and small. Holiday generates consistent hilarity from the sight of this good-natured clown pratfalling his way into small-scale trouble, be it during a canoe ride in which the craft splits in half and takes on the appearance of a chomping shark, or an attempt to carry luggage into a house that results in Hulot spiraling his way through the building and out the back door. Devoid of any real plot, and with dialogue used sparingly—either as incidental background noise, or as a means of poking fun at a pompous Marxist bore and work-obsessed paterfamilias—the film revolves around Hulot but hardly confines itself to merely his high jinks. By shifting focus to other vacationers, including a boy playing pranks with a magnifying glass and an old lady who takes an eventful ride in Hulot’s clunker of a car, Holiday reveals a tremendous generosity of spirit. With its twinkling musical theme and its spate of laid-back whimsical gags, this droll physical-comedy masterpiece has a rhythmic grace not unlike the crashing waves of its opening shot. Availability: The Criterion DVD of Mr. Hulot’s Holiday is out of print, but it can still be obtained through Netflix’s disc delivery service.